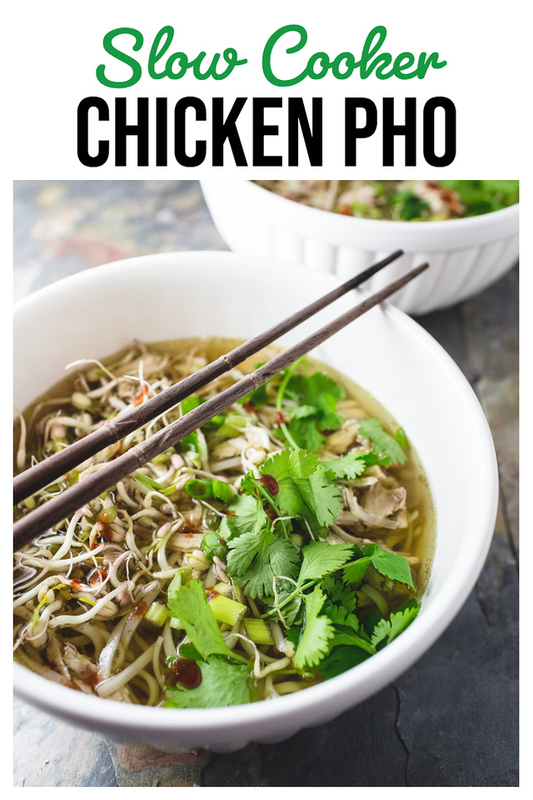 Click here to pin this Slow Chicken Pho now! Anyone else a huge fan of pho? I could probably eat it every day for the rest of my life and be happy. Well, that and pizza, that’s all I need. I was about to then say … “and this ashtray, that’s all I need.” Then I realized that probably most of you wouldn’t get that reference. Do you get it? If so, then like me, you are a Steve Martin fan from way back. If not, go watch The Jerk – it’s such a great movie. Sorry, I digress, back to this Slow Cooker Pho. Make it. As a matter of fact, you can put it in your slow cooker and then watch The Jerk. The basics for any good bowl of noodles is the broth. This is why the slow cooker shines. You can simmer a flavorful broth all day long! This recipe, which I found in Not Your Mother’s Slow Cooker Recipes for Entertaining has a few extra steps to make the broth even more flavorful. Before placing the spices in the cheesecloth, you toast them first. Warning…your house will smell fantastic. You also broil the onion and ginger before adding. All of these extra touches take a small amount of time, but I think they add so much to final dish. It’s these layers of flavors that really add flavor. Once you get the star anise, cloves and cinnamon sticks, you might as well try my Slow Cooker Beef Pho don’t you think?! It’s one of my most popular recipes on the blog! This was wonderful. Every bit as good as I hoped it would be! The layers of flavor that is created by toasting the spices and roasting the onions and ginger is amazing. Better than any pho I’ve had in restaurants! 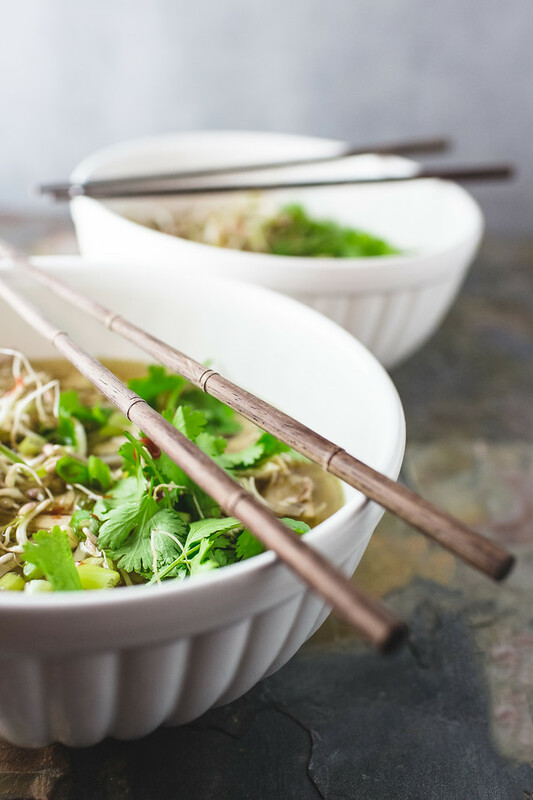 Don’t skimp on the garnishes, the fresh pops of flavor really enhance the flavors of the pho. If you’re in the mood for slow cooker chicken soups, you might also like Slow Cooker Chicken Udon Noodle Soup or Slow Cooker Spicy Chicken Soup with Beans. Pho is so easy in the slow cooker! 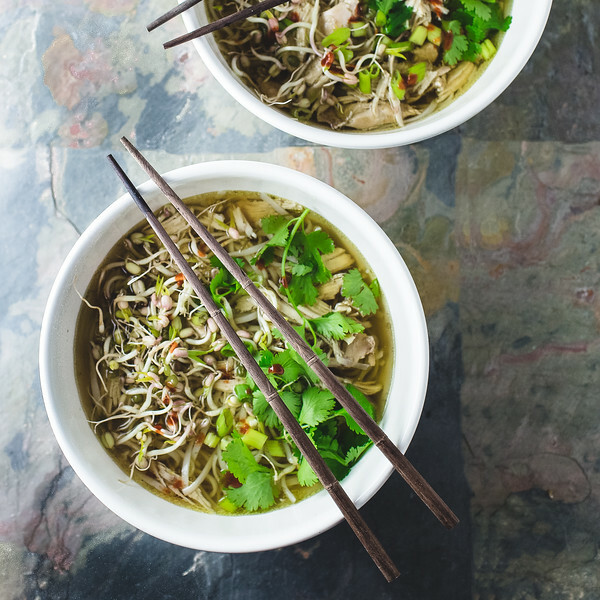 This Slow Cooker Pho with Chicken is so delicious! Place the chicken, the white parts of the green onions, garlic and cilantro stems in slow cooker. Fill the slow cooker 3/4 full with the chicken stock. Cover and set on high. Place the onion and ginger on a baking sheet and broil for about 8-10 minutes, turning, until lightly charred. Add to the slow cooker along with the fish sauce. 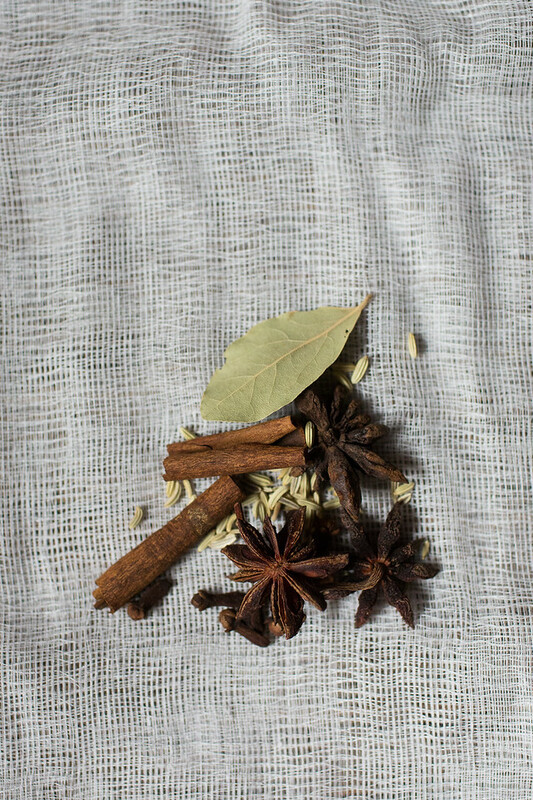 Place the star anise, cloves and cinnamon sticks in a small dry skillet. Toast over medium heat, shaking them, for about 3-4 minutes. Place in a square of cheesecloth along with the fennel seeds and bay leaf. Tie with kitchen twine and add to slow cooker. Cover and cook for 4 1/2 to 5 hours. Life the chicken from the slow cooker with a slotted spoon. Strain the broth through a double layer of cheesecloth into a large heatproof bowl. Discard all of the solids and return the broth to the slow cooker and turn to low. Cook the rice noodles per directions and rinse in cold water. Shred the chicken and return it to the slow cooker. Divide the noodles among the individual bowls, ladle the hot broth and chicken over the top. Serve immediately with garnishes on the side. That’s a really yummy looking recipe! I’d love for you to share over at a new party called Let’s Party https://themarkandjanshow.com/2017/12/27/lets-party-1/ … look forward to seeing you there! I have just bought a slow cooker, can’t wait to try this recipe. I also really like Pho. Thank you for sharing the recipe! I just moved to a tiny coastal town in Costa Rica, and I haven’t been able to find any Pho. This recipe will be great to try out! I will save this for my Chinese New Year party, it looks good. I can just smell how wonderful it must be. That’s the best thing about soupy noodles. That first inhale of delicious broth. Beautiful. And now I want soup. Pam, this looks so comforting and what a twist on a slow cooker meal. I love it! Pinned. Recently I have been experimenting with noodle dishes for Marion and myself. As you say, they are so yummy and easy to prepare. However, I have not been able to bring myself to try them in a slow cooker. I’m not sure why but it just seemed like more work which in the case of the slow cooker, isn’t usually the case.